It is cold, rainy and the perfect day for cozy cups of coffee and snuggling on the couch! Do you have a packed Saturday or a relaxing one after all of the holiday traveling? This Mixed Citrus Green Salad is one of those salads that you can just do a quick chop and then throw everything on a plate! I added chicken for protein and adored all of the different flavor combinations from the fruit! Combine dressing ingredients (all except poppy seeds) in a blender and process until blended. Add poppy seeds and pulse once. Refrigerate until ready to use. Place salad greens on individual plates. Slice avocado and toss in lemon juice (or reserved citrus juices from any can of fruit, such as mandarin oranges). 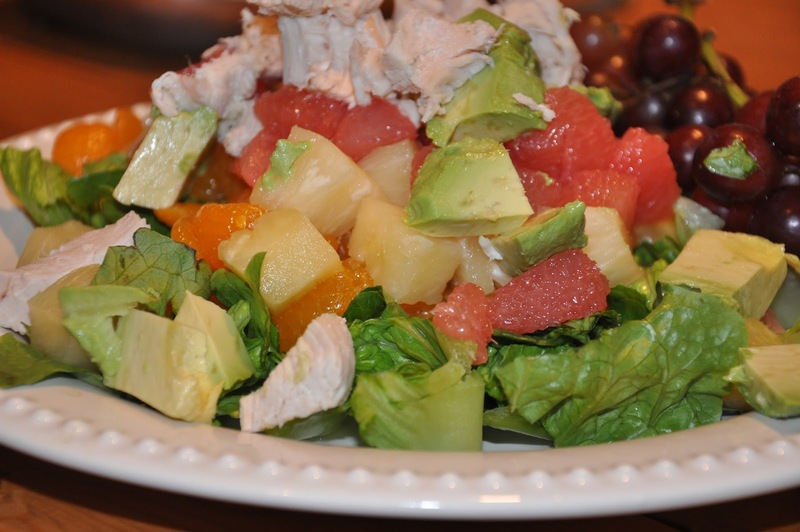 Top salad with fruit (as much as you like of each) and avocado slices. Add toasted walnuts. Drizzle with dressing and serve. Wow this sounds good! I'm working on my monthly meal plan and I'm adding it!! Hi Elizabeth!! Thanks for checking in on my blog, from Wynne's page!! After reading your "about me", I think we are a lot alike, except for the part where you are an amazing cook!! :) What are great ministry you have using your God given talents!! Hi Elizabeth! Thank you so much for stopping by my blog from Wynne's page. I love your blog! I'm trying to be a better cook this year so I have a feeling that your blog will become a favorite of mine! I'm addicted to citrus salads. I've been making a citrus and avocado carpaccio all the time. I love this dressing on yours.